Haiti: The U.S. State Department issued a travel warning March 12, cautioning tourists to avoid the country because the local emergency response infrastructure remains weak four years after a massive earthquake. The January 2010 quake killed more than 200,000 people, according to Haitian estimates, and destroyed a quarter of a million residential and commercial buildings. Though incidents of crime against Americans decreased in 2013, kidnapping and murder rates continue to be high, particularly in the Port-au-Prince area, and medical services remain substandard. 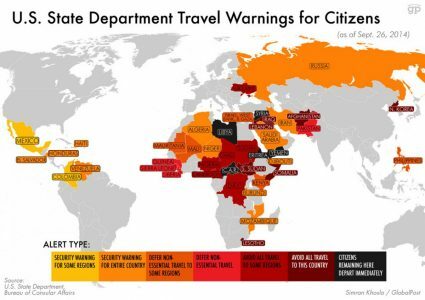 The State Department recommends that travelers use organizations that have solid infrastructure, evacuation and medical support options in place before visiting. Brazil: Just three months before the World Cup, the U.S. Centers for Disease Control and Prevention advises those attending the monthlong soccer tournament to take extra precautions four to six weeks before travel. The CDC recommends being up to date on routine vaccinations, plus hepatitis A, typhoid, hepatitis B, yellow fever and rabies vaccines. Appropriate insurance coverage is advised. Travelers also should protect themselves against mosquito bites and beware of contaminated food and water. For security, people should avoiding traveling at night or carrying large sums of cash or expensive jewelry. France: Air pollution caused the government to impose strict auto limits in Paris. As of Monday, officials allowed only cars with odd-numbered license plates to be on the road one day and even-numbered the next. The plan was to continue until smog levels dropped below toxic levels. Electric and hybrid cars, taxis, buses and emergency vehicles were exempt, as were cars with three or more people. The smoggy conditions were caused by a combination of cold nights and warm days, and resulted in air-safety levels exceeding quality standards for the five days before the ban. Germany: Tourists traveling overland from Poland to Germany should be prepared to show passports during border crossings after a seven-year lapse in police checkpoints. Officials said Brandenburg’s border regions continue to experience increased crime, with rates climbing 10 percent from 2012 to 2013. Authorities also said Polish and German police are working together to help reduce crime along their border. Nepal: A tourist hiking with a friend and a guide near Katmandu was robbed of large sums of cash, identification and other valuables March 16. The incident occurred on the Sundarijal-Chisapani-Helambu route via Shivapuri Nagarjun National Park. The victim was mugged by four young men who escaped before her friend and guide could come to her aid. Though thousands of hikers pass through the region each year without incident, the Bhrikuti Mandap tourist police have received more than 600 complaints in the last eight months. Hikers should always travel in groups and avoid isolated areas when alone.